Professor Small’s talk will center on public history, museums, memory, and the legacy of enslavement. 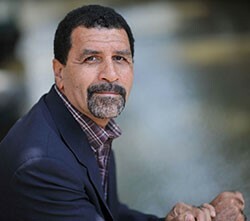 Through his work on representations of slavery in museums in the United States, the United Kingdom, and the Netherlands, Prof. Small will examine how Black populations and their supporters continue to mobilize around reparations, and how the exchange of diasporic resources provides sustenance in the struggle to decolonize the mind. Stephen Small is Associate Professor in the Department of African American Studies at the University of California, Berkeley. He was appointed “Extraordinary Professor for the Study of Dutch Slavery and its Legacy” at the University of Amsterdam in 2010. He is currently resident in Madrid where he is the Study Center Director of the University of California’s Education Abroad Program, Spain. At UC Berkeley he is Faculty Associate in the Center for Race and Gender, the Center for Latin American studies, the Center for African Studies and the Institute for the Study of Societal Issues.